Reldith is an Altmer farmer living in Cowflop Farmhouse in Rorikstead. She loves her work, as evidenced by her describing her profession as the noblest of callings: "There is a joy in honest labor you won't find elsewhere." She lives with and is the adoptive mother of Ennis, who runs the business side of their farm. Reldith wears a set of farm clothes, a pair of boots, and a pair of gloves. She is equipped with an iron dagger, and carries a key to the farmhouse, as well as a selection of common loot and gold. Reldith begins her day at 6am when she wakes up for the start of her workday. She will spend just over eleven hours working in the fields, quitting work for the day to go inside and eat at 5:10pm. Reldith will spend the rest of the day inside Cowflop Farmhouse, just relaxing for the last few hours of her day. She will finally retire to her bed at 9pm, rising from sleep at 6am the next day to repeat her schedule. Reldith will greet the player in a number of ways if approached or talked to. She will threaten to call the guards on the player if they misbehave: "Did you see those guards? Get out of line, and you'll have them to deal with." 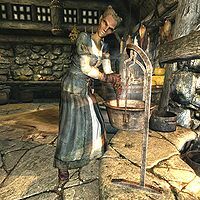 Continued interaction will have her claim that Rorikstead does not tolerate lowlifes: "We're honest, hardworking folk here, and we don't suffer beggars or thieves." Reldith will express her respect for her occupation in additional comments: "City folk might look down on us, but what's wrong with farming? Everything we've got, we had to earn with our own sweat." She will also direct the player towards Erik to help him become an adventurer: "You look like the adventurous sort. You should talk to Erik, the innkeeper's son. He could use your help." "Your farm is doing very well. You must be proud." "Do I detect a bit of jealousy in your tone? I would hardly blame you. What calling could be more noble than this? I see in your eyes that you think I jest. I assure you, I don't. I am proud, and rightfully so, of the work we do here. Working the soil with your hands, seeing your seeds take root and grow, tending a herd... there is a joy in honest labor you won't find elsewhere." "Where do you sell your surplus crops?" "In Whiterun, mostly. Ennis handles the business arrangements, but I know that he has a few purchasers who give us a fair price. Ennis prides himself on his shrewd business schemes. For my part, I'm far happier working with cattle and crops than with people." Reldith will take part in a number of conversations with the other residents of Rorikstead, particularly Ennis. Ennis: "Have you given my idea any more thought? You said you'd let me know yesterday, and that obviously didn't happen." Reldith: "Oh, I don't know. Yes, we'd make more money, but I don't like the idea of you traveling alone out there with the war and talk of dragons." Ennis: "Come on now, we discussed that. I wouldn't be traveling all of Skyrim. It'd just to Whiterun and back, that's it." Reldith: "Tomorrow. I'll let you know tomorrow." Reldith: "Another fine day at work in the fields. I don't envy those city folk who miss out on the joys of working the land." Ennis: "I'll tell you who I don't envy - those poor children who lost their parents in this war." Reldith: "Lives lost, crops burned, land ruined... there's no greater sin than war. And yet, you were an orphan, and you've made something of your life." Ennis: "I was lucky. If you hadn't rescued me, I'd probably be a thief, a mercenary or something even worse." Reldith: "It's too fine a day to dwell on such things. Let's get back to work and forget about wars and orphans for awhile." 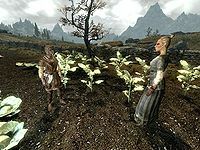 Reldith: "The way our crops have been growing, Rorikstead must have the richest soil in the hold." Ennis: "Maybe we should start selling the soil along with the dung. We could make a tidy profit." Reldith: "Hah! Who in their right mind would pay for dirt? You'd get laughed out of Whiterun for even trying it." Ennis: "Hey, people have paid money for stranger things. Take our cow dung - we sell that by the wagon load." Reldith: "When you're rich, you can waste as much money as you like on far-fetched business ideas. In the meantime, there's a farm to run." She will also be offered some brushes from Jouane Manette. She will occasionally be questioned by Rorik on the progress of the planting. Rorik: "Are you making good progress with the planting?" Reldith: "So far, things are going well. Let's just hope the weather holds." Ennis will speak fondly of Reldith whenever he mentions her: "You talk to Reldith yet? She's like a mother to me." Although he will also pay himself a compliment at times: "Reldith is the hardest-working farmer in Rorikstead, but I'm the one with a head for business." This page was last modified on 9 April 2017, at 11:24.